A fast and robust tool for adding dogbone fillets to the inside corners of a model. See the video and the full product description below for complete information about what this add-in does and how to use it. Click the correct button below to download a fully functional version of the add-in that will work for 15 days. After 15 days you must purchase a license to continue to use it. Purchasing this product will provide you with a license key that you can use to activate the product so it will continue to run after the 15-day trial period. You DO NOT need to purchase it to use the 15-day trial. Dogbones are typically used as a workaround to a problem that’s the result of cutting material using a mill or router. Because you’re cutting something using a spinning cutter, the resulting cut always has round internal corners. This is illustrated in the workflow below. First, is a simple example of an assembly where two parts are meant to fit together. Below, on the left, is the toolpath to cut the cavity where the yellow part will fit. Notice that the toolpath has sharp corners. On the right is the simulation of the machined result. The internal corners are rounded because the tool is round. Because of the rounded corners, the yellow part no longer fits into the green part because of the interference highlighted as red in the picture below, on the right. There are two ways to solve this problem. One is to manually remove the rounded corner, typically with a chisel. However, if you’re using CNC to automate the cutting of an object, you probably don’t want to have to perform a lot of additional manual work to finish the part. The other option is to remove more material in the CNC process to clear out the corner. The extra machining performed to remove this material is commonly referred to as a “dogbone” because in some cases it can resemble the shape of a bone you would feed to a dog. 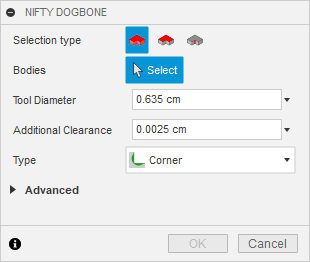 The Nifty Dogbones add-in supports the creation of several shapes of dogbones, which are described below. Once the installer for windows has been downloaded, run the installer exe to install the add-in. You’ll need to restart Fusion 360 so it can find the add-in and add the buttons into the user-interface. Once the installer for Mac has been downloaded, you’ll need to run the .pkg file. To get around the security, you can right-click and choose “Open”. You’ll be guided through the install process. If Fusion 360 is running, you’ll need to restart it so it can find the add-in and add the buttons into the user-interface. You can purchase a license at any time. For Nifty Dogbone for Fusion 360, you are purchasing a perpetual license, which means it’s a one-time purchase that allows you to continue to run the software without any time limits. As part of that purchase, you’ll also have access to updates and support. It is not a subscription that you have to renew after a certain period of time but is a license to use the add-in with no time limits. 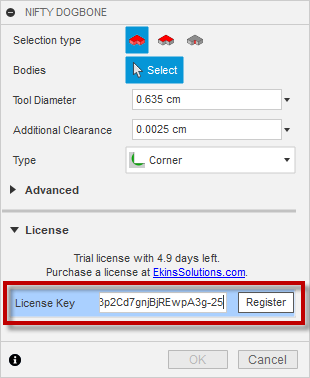 When you purchase a license, you’ll be provided a license key. To enable the add-in you can copy and paste the provided license key into the command dialog and click the “Register” button. 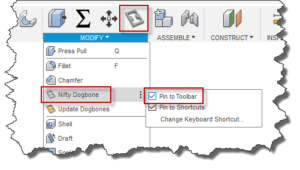 The license of Nifty Dogbone for Fusion 360 will then be activated for your Autodesk account and the add-in will function on any machine where you’re logged into your account. However, you must manually install the add-in on each machine, but the licensing process only needs to be done once. Once installed, you should see two new commands in the MODIFY panel of the MODEL workspace, as shown below. If you click on the three vertical dots to the right of the command, the option to “‘Pin to Toolbar” will appear and if selected will display the command in the main toolbar, as shown below. Running the command will display the NIFTY DOGBONE dialog, as shown below. The primary input is the geometry selection, the diameter of the cutting tool, additional clearance, and the type of dogbone to create. There are three types of selection methods that control what you can select and also what geometry will have a dogbone added to it. The “Selection type” buttons at the top of the dialog let you choose whether to select bodies, a face or edges. Bodies – If you choose the “Body” selection option you can select entire bodies. The “up” direction for the body is automatically determined and all edges that are valid to have a dogbone will have a dogbone added. As far as geometry, there’s no other input required besides the selection of one or more bodies. 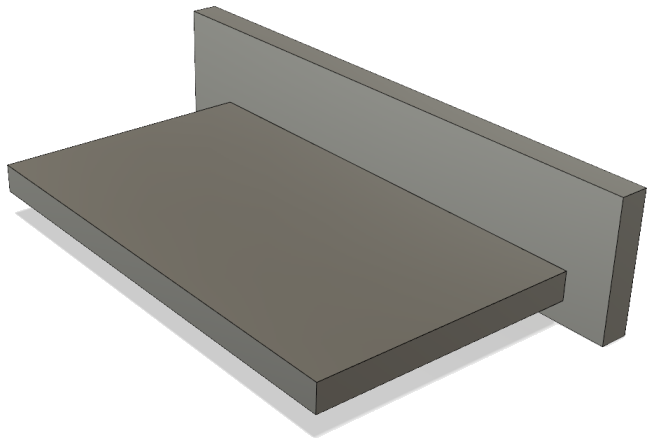 Upper Face – If you choose the “Upper Face” selection option, you can choose any planar face and that will be treated as a face on the “upper” side of your model and is used to define the “up” direction for the body as the dogbone edges are automatically determined for that machining direction. 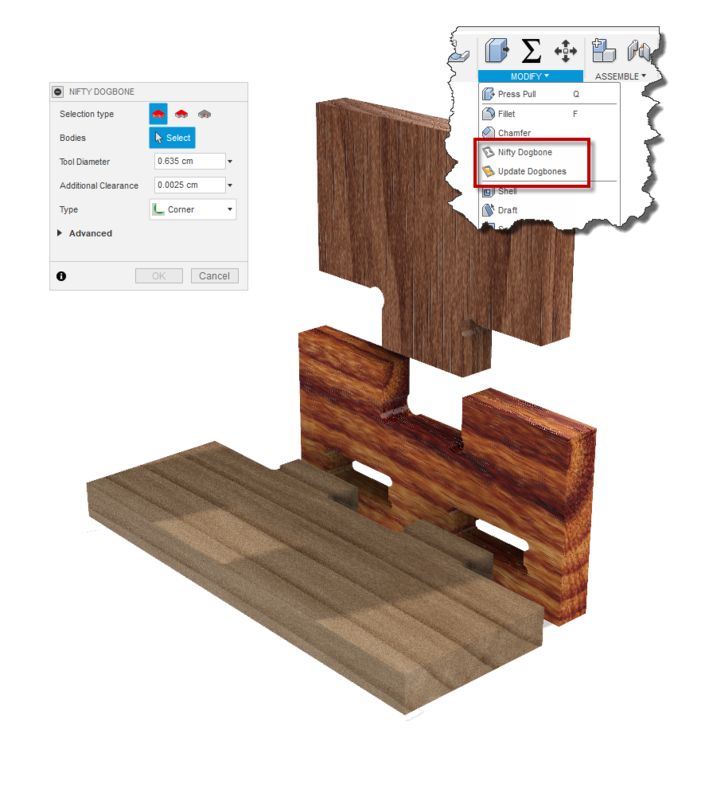 Edges – If You can choose the “Edge” selection option you can individual select edges on the model to add dogbones to. 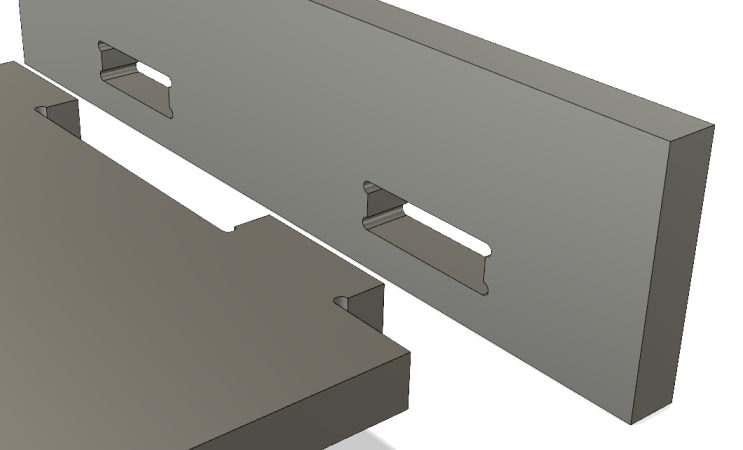 The first edge selected defines the machining orientation and all other edges added must be in the same orientation. Using any of the selection options, a preview of the dogbones that will be created is shown in the model, as illustrated below. The Tool Diameter setting is the diameter of the tool you’ll be cutting with. All dogbone types, add a circular cutout to remove the interfering corner. The diameter of this cutout is the tool diameter plus the additional clearance. Because of the way computers work and potential tolerance issues with the CAM software, it’s best to have some additional clearance in the geometry so when you cut the part, the CAM software will be able to determine that the tool can fit within the dogbone. The “Type” dropdown lets you choose one of four different types of dogbone, which are described below. The “Corner” type of dogbone removes extra material from the corner so that the corner is completely cleared. In the picture below on the left, you can see the dogbone in the corner and the picture on the right clearly shows the extra material that was removed. This is done using the same CNC bit that is used for the rest of the processing so it doesn’t take hardly any more time to machine and doesn’t require any additional manual work. The downside for some is that they don’t like how it looks because the crescent-shaped wedges might be visible in the finished product. In the “Advanced” group in the dialog, there is a “Visible gap” field displayed that displays the size of the visible portion of the dogbone. The value shown is computed for a 90-degree corner. It is a display-only value and can’t be edited but will update as you change the tool diameter and additional clearance. The “Minimal Corner” dogbone is a slight variation of the corner dogbone. This type of dogbone was originally described in a post by FABLAB RUC. You can read more about it on their site. The difference between a minimal and standard corner dogbone is the minimal dogbone doesn’t completely clear out the corner. They found they could leave a small amount of material in the corner and then force the parts together. The advantage to this is that the visible crescent that’s left is much smaller and the fact that the parts are forced together provides a tight friction fit. One thing that affects the success of this style of dogbone is the density of the material. A soft material will be easier to force into place, whereas a harder material will be more difficult and could result in damage to other areas as you pound the pieces together. The picture on the left shows the minimal corner dogbone. It looks just like the standard corner dogbone until you try to put the two pieces together, as illustrated in the center picture. The corner hits before the part is fully in place. The picture on the right illustrates the amount of interference there is between the two boards that will need to be overcome when the parts are assembled. When the “Minimal Corner” type of dogbone is selected, there is an extra option in the “Advanced” group in the dialog. 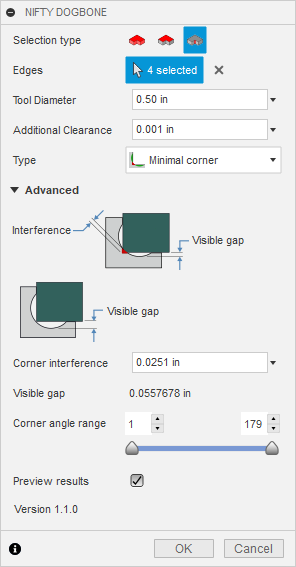 The “Corner interference” field is displayed and allows you to edit the amount of interference in the corner. The visible gap value will change as you edit the amount of interference. These values are all computed for 90-degree angles. Another style of dogbone is to remove material along one of the sides or the dogbone corner. This is illustrated in the picture below. The material can be removed in either direction an also completely clears the corner. The result, in this case, leaves more of the cut visible. Some people consider this a decorative element of the finished design. Depending on the design, it’s also possible with this type of dogbone, to completely hide it. The picture below illustrates an assembly that uses slots and tabs to assemble two parts. The picture on the left represents the initial CAD model, and the picture on the right shows what the result will be without any dogbones. There is interference on both pieces so they won’t fit together. Below are the parts after creating “along an edge” dogbones to both the tabs and the slots. And finally, below is the result, after assembling the two parts. In this case, the dogbones are completely hidden by the boards. When you expand the “Advanced” group there is some additional information and settings available. What’s displayed changes depending on the type of dogbone currently selected. These are described above for the Corner and Minimal Corner types. 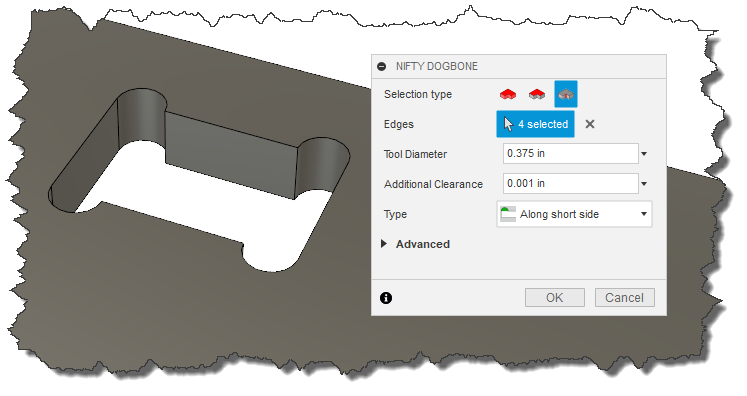 The Nifty Dogbone add-in automatically finds all of the edges when selecting a body and when selecting edges, it limits the selection to valid edges. One of the factors it uses when determining which edges are valid is the angle between the faces that the edge connects. 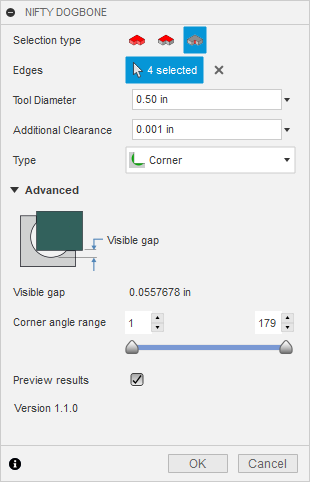 The “Corner Angle Range” slider lets you specify the valid angle range. 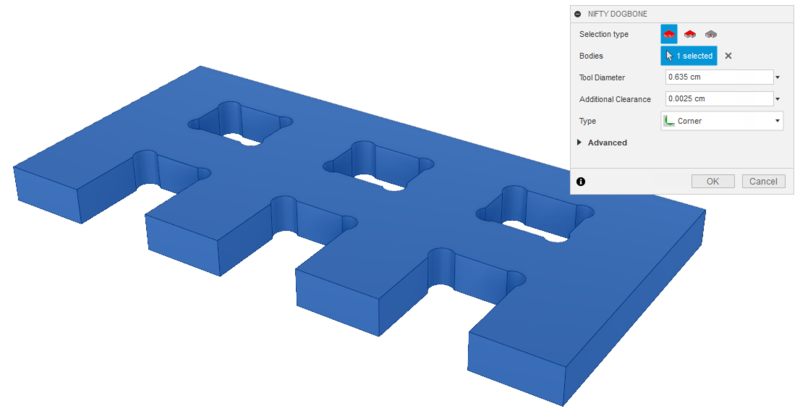 This setting controls whether the model is modified to show a preview of the dogbones that will be created. Because it’s typically fast to generate the preview it’s usually nice to have this enabled because it’s very useful to see the preview to verify that the edges you want a dogbone are being included. It also helps to validate that the current size and type of dogbone is what you want. There are two cases where turning this off can be useful. The first is if you have a body that has a lot of edges that are valid for dogbones. This will improve the performance when selecting bodies or edges but in most cases, the performance isn’t a problem and having the preview is worthwhile. The second is when creating corner dogbones and selecting individual edges. When you select an edge and the dogbone preview is created, that edge is consumed and no longer available. This isn’t true for the other types of dogbones. If for some reason you picked a wrong edge and need to unselect it, you can turn off the preview, which will make all of the edges that are currently selected available to be de-selected. You can toggle the “Preview results” setting on and off as needed for this purpose. 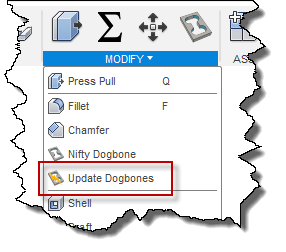 The second command added by the Nifty Dogbones add-in is the “Update Dogbones” command. This will recompute and recreate all existing dogbones. If you’ve added dogbones to a model and then need to make changes to the model geometry, depending on the changes you make, the dogbones may no longer be correct. 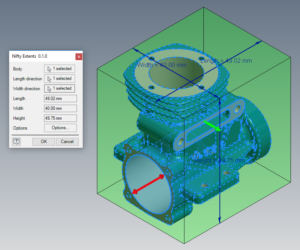 Because of limitations with the Fusion 360 programming interface, it’s not currently possible to have them automatically update as standard Fusion 360 features do. 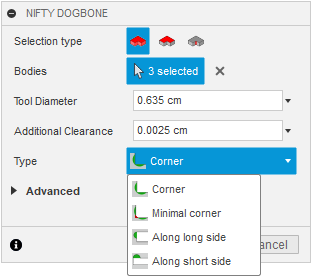 To work around that, the Nifty Dogbones add-in provides a semi-automatic way to update them. If any dogbones are incorrect, just run the “Update Dogbones” command and they will all recompute. If any bodies were selected, any new valid edges on the body will also have dogbones added. Here’s an example to illustrate what the update command does. The picture on the left is the original model. The one in the center is the model after making some modeling changes. None of the dogbone features are correct. The picture on the right shows the model after running the “Update Dogbones” command.